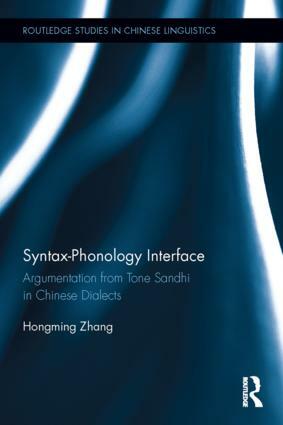 This book centers on theoretical issues of phonology-syntax interface based on tone sandhi in Chinese dialects. It uses patterns in tone sandhi to study how speech should be divided into domains of various sizes or levels. Tone sandhi refers to tonal changes that occur to a sequence of adjacent syllables or words. The size of this sequence (or the domain) is determined by various factors, in particular the syntactic structure of the words and the original tones of the words. Chinese dialects offer a rich body of data on tone sandhi, and hence great evidence for examining the phonology-syntax interface, and for examining the resulting levels of domains (the prosodic hierarchy). Syntax-Phonology Interface: Argumentation from Tone Sandhi in Chinese Dialects is an extremely valuable text for graduate students and scholars in the fields of linguistics and Chinese. Hongming Zhang is a leading expert on tone sandhi, and this book is the culmination of a lifetime’s research.